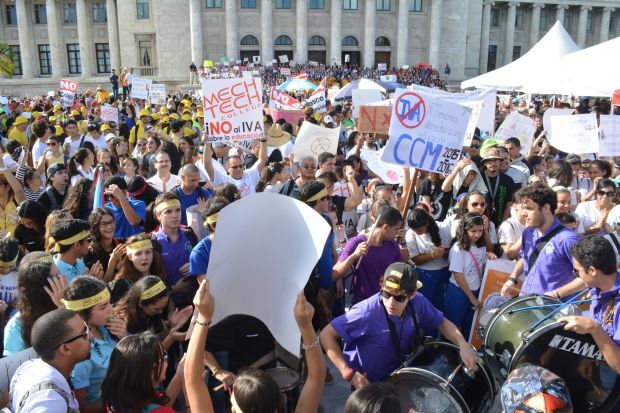 SAN JUAN, Puerto Rico (CNS) — Hundreds of Catholic school students, parents, teachers, administrators and supporters formed a new coalition and rallied against proposed tax reforms that they say threaten the survival of primary and secondary Catholic education in Puerto Rico. As part of a comprehensive reform of its tax structure, the Puerto Rican government proposes replacing the current sales tax of 7 percent with a value-added system that would amount to a 16 percent tax, which Catholic school officials say would hurt Catholic education particularly, and private education generally, when applied to tuition, lunches, uniforms and textbooks. Besides consumption, the tax reform is also expected to affect personal income tax and business-related taxes. Unlike a regular sales tax, a value-added tax is imposed at every step of the supply chain of goods and some services, including manufacture, shipping, importation, distribution and retail sale. Facing the threat of such a tax, San Juan’s Catholic schools superintendent, Ana Cortes, met with representatives from several community segments to explore forming a joint opposition effort. Out of the meeting came Todos Somos Pueblo (We all are the people), a wide-ranging coalition of 85 organizations, with the archdiocesan Vicariate of Catholic Education as a leading force. Father Santa’s call to all private schools, colleges and universities to join the effort paid off. By the time Catholic leaders started their formal morning program at the rally with an invocation and prayer, an estimated 1,000 Catholic students from San Juan and two other dioceses waved banners while chanting slogans to the beat of tropical music provided by band members from Nuestra Senora de Belen academy. Helping coordinate the rally and participating in it were student organizations representing the wider public college population from across the island. They gathered about a mile away from the Capitol building in Old San Juan and reached the Capitol square by early afternoon, pushing unofficial crowd estimates up to around 7,000. Puerto Rico’s Catholic education system has been declining for decades. The San Juan Archdiocese had 73 schools in 1975 and today has 57, said Father Santa. Two are scheduled to close in May. He explained the decline started after the Second Vatican Council, when fewer women religious entered the education field, creating the need to hire lay teachers — with their salaries added to the overall budget. In addition, he said, the number of students per classroom has declined, the cost of educational technology is high and, more recently, the number of parents who are unemployed is rising. Puerto Rico’s unemployment rate is 12.4 percent, as of January. Statistics show that the unemployment rate has averaged 15.41 percent annually from 1976 until this year. The value-added tax issue has been simmering since December 1998, when University of Puerto Rico economics professor Evaldo A. Cabarrouy published a 38-page paper titled “The Value Added Tax: An Alternative for Puerto Rico,” catching local politicians’ attention. Three months into his current term, Gov. Alejandro Garcia Padilla took the first step in that direction, at a time when the island’s economy was already practically bankrupt. The governor had a measure that includes value-added tax provisions and a general “fiscal transformation” introduced in the Legislature Feb. 11. Mass opposition to the bill keeps growing, with multiple protests sometimes held on a single day. Cortes told the press Feb. 26 that Catholic schools would be rallying in opposition. Reacting to Cortes’ statement, Padilla said the following day he was asking the Legislature to modify the bill inserting a value-added tax exemption for private education. However, three days later he backtracked, explaining “some private schools costs” would still carry the new tax. “We will protest against the government’s perception that private education is a commodity, not a social value,” Cortes said in response.